The archaeon, Methanosarcina acetivorans strain C2A forms methane, a potent greenhouse gas, from a variety of one-carbon substrates and acetate. Whereas the biochemical pathways leading to methane formation are well understood, little is known about the expression of the many of the genes that encode proteins needed for carbon flow, electron transfer and/or energy conservation. Quantitative transcript analysis was performed on twenty gene clusters encompassing over one hundred genes in M. acetivorans that encode enzymes/proteins with known or potential roles in substrate conversion to methane. The expression of many seemingly "redundant" genes/gene clusters establish substrate dependent control of approximately seventy genes for methane production by the pathways for methanol and acetate utilization. These include genes for soluble-type and membrane-type heterodisulfide reductases (hdr), hydrogenases including genes for a vht-type F420 non-reducing hydrogenase, molybdenum-type (fmd) as well as tungsten-type (fwd) formylmethanofuran dehydrogenases, genes for rnf and mrp- type electron transfer complexes, for acetate uptake, plus multiple genes for aha- and atp-type ATP synthesis complexes. Analysis of promoters for seven gene clusters reveal UTR leaders of 51-137 nucleotides in length, raising the possibility of both transcriptional and translational levels of control. The above findings establish the differential and coordinated expression of two major gene families in M. acetivorans in response to carbon/energy supply. Furthermore, the quantitative mRNA measurements demonstrate the dynamic range for modulating transcript abundance. Since many of these gene clusters in M. acetivorans are also present in other Methanosarcina species including M. mazei, and in M. barkeri, these findings provide a basis for predicting related control in these environmentally significant methanogens. Methanosarcina acetivorans strain C2A is a mesophilic anaerobic archaean isolated from a kelp-degrading enrichment of marine origin . It is one of the more metabolically versatile methanogens in that it can use acetate as well as one-carbon substrates including mono-methylamine, di-methylamine, tri-methyl amine, methanol, or carbon monoxide as a sole source of carbon and energy. As a result, it contributes to the formation of two green house gases, methane and carbon dioxide during the natural recycling of organic carbon in anaerobic environments. The biochemical pathways for carbon flow from the alternative substrates to methane are reasonably well established [2–4]. However, little is yet known about the expression of the genes encoding the described pathway enzymes or accessory proteins needed for electron and carbon flow. Additionally, the genome contains seemingly redundant copies of many other genes with implied roles in carbon or energy metabolism . For example, M. acetivorans possesses four gene clusters annotated for formylmethanofuran dehydrogenase, three gene sets annotated for hydrogenase, five distinct clusters of genes encoding membrane-bound and/or soluble-type heterodisulfide reductase enzymes, and two gene clusters encoding distinct membrane bound ATP sythase complexes. Orthologs of many of these genes are present in other described Methanosarcinaceae species including M. acetivorans, M. mazei, and M. barkeri (Table 1, described below), plus in other methanogenic species. Comparison of genesa and corresponding enzyme complexes in sequenced Methanosarcina genomes. a The presence/absence of the corresponding genes/enzymes in the three genomes are indicated by Y (yes) or N (no). For a complete inventory of all M. acetivorans genes and designations listed see Figures 1-6. The expression and/or physiological roles of many of these genes are either poorly understood or unknown. Initial genomic and proteomic studies with M. acetivorans and M. mazei have initially addressed this but did not clearly resolve these questions due in part to DNA/protein sequence similarities and/or detection limits of the methods used . Additionally, these approaches did not quantitatively address how mRNA abundance levels vary during the alternative cell growth conditions. In the present study we address the above questions using M. acetivorans as a model system to examine gene expression in response to substrate availability. Using quantitative PCR and supporting molecular methods, the resulting data establish expression levels of genes for over twenty enzymes/enzyme complexes for carbon flow and/or energy conservation. The resulting findings define two major substrate-specific gene families for acetate and methanol utilization for this model organism. These studies also lay a foundation to purse the molecular basis of central catabolic pathway gene regulation in this major class of methanogenic archaea. The M. acetivorans genome contains many seemingly redundant copies of genes annotated with roles in methanogenesis . These include two sets of genes annotated for a molybdate-type formylmethanofuran dehydrogenase (fmd), and two gene sets for a tunsten-type formylmethanofuran dehydrogenase (fwd), five heterodisulfide reductase-like hdrED and hdrABC gene clusters for reduction of Coenzyme M-Coenzyme B heterodisulfide, two sets of vht genes for F420 non-reducing hydrogenase, and two sets of genes for ATP synthesizing complexes . Additional genes include frh hydrogenase-like genes, plus additional genes for rnf- and mrp-type membrane associated bacterial electron transfer complexes, plus genes needed for acetate metabolism (discussed below). Homologous and seemingly "redundant" genes/gene sets are also found in the genomes of M. mazei, and M. barkeri (Table 1). The reason for these genome makeups is currently unknown. M. acetivorans was used as a model microorganism to evaluate expression of over twenty sets of genes using gene specific primer pairs designed to eliminate cross-hybridization when DNA sequence similarity exists (Methods). RT-PCR, pPCR, and 5' analysis was then performed using RNA isolated from M. acetivorans cells grown with either acetate or methanol as the sole source of carbon and energy. In this study, a number of new M. acetivorans gene designations were established to distinguish among homologous orfs (Table 1, and described below). Two of the four previously annotated sets of genes for formylmethanofuran dehydrogenasethese were designated as molybdenum-type enzymes and are named here as fmdE1F1A1C1D1B1 and fmdF2A2C2D2B2 (Figure 1A). Two additional gene sets were annotated as tungsten-type formylmethanofuran dehydrogenase, and are designated here as fwdD1B1A1C1 and fwdG2B2D2 (Figure 1B). 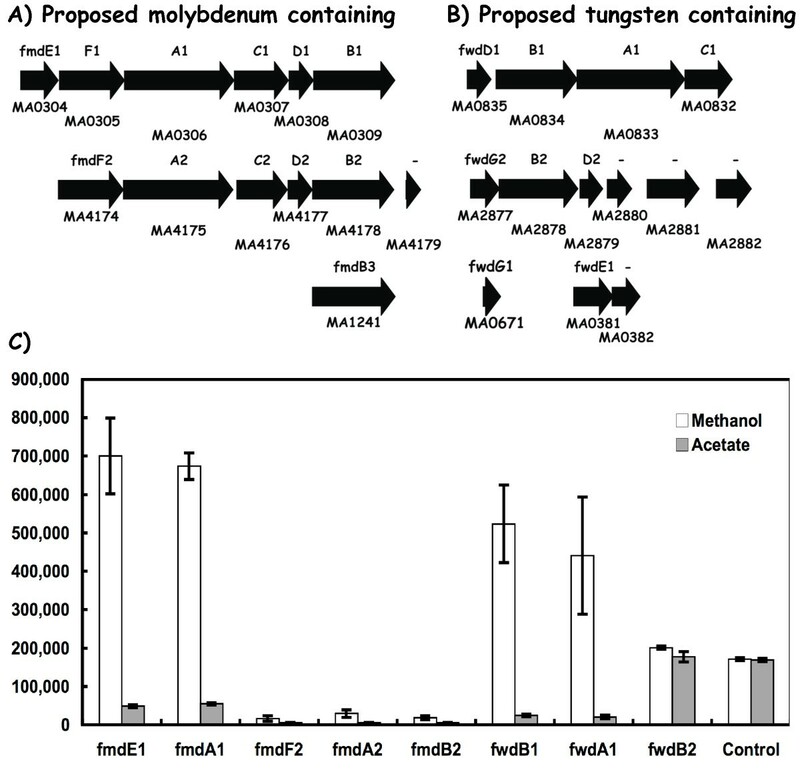 Using qPCR analysis methods (Methods), the molybdenum-type operon reporter genes fmdE1 and fmdA1 (Figure 1A) were shown to be expressed at 14-fold higher levels during methanol growth conditions relative to acetate growth (Figure 1C). The second set of reporter genes (fmdF2, fmdA2, and fmdB2) were expressed about 2-fold higher during these conditions, but the maximal level of expression was less than 5% of that seen for the fmdE1 and fmdA1 genes. Noteworthy, the fmdE1 and fmdA1 gene expression values were within the same range observed for the fpoN and fpoL genes that encode subunits of the F420 H2 dehydrogenase needed for central pathway electron transfer functions (described below). The high transcript abundance of the fmdE1F1A1C1D1B1 gene cluster implies a major role of this gene set during methanogenesis in contrast to that for the fmd2 gene set. Differential expression of genes annotated for fmd and fwd in M. acetivorans. Panel A) the six and five gene fmdE1F1A1C1D1B1 and fmdF2A2C2D2B2 clusters encoding the two putative molybdenum-type formylmethanofuran dehydrogenase enzyme complexes. Panel B) the four and three gene fwdD1B1A1C1 and fwdG2B2D2 clusters encoding the two putative tungsten-type formylmethanofuran dehydrogenase enzyme complexes. The Genebank identification number (MA number) is shown below each gene while the individual gene designation is shown above. Panel C) RT-PCR data for the indicated fmd and fwd genes. Values are expressed as copy number (Methods). The annotated tungsten containing formylmethanofuran dehydrogenase gene cluster fwdD1B1A1C1 reporter genes designated fwdB1 and fwdA1 (Figure 1B) were also expressed 15-fold higher levels during methanol growth relative to acetate (Figure 1C). Interestingly, this was within the magnitude observed for the fmdE1F1A1C1D1B1 gene cluster. However, the second tungsten-type gene cluster (as reported by the fwdB2 gene), was constitutively expressed and at a level about one-half of that observed for either fwdA1 or fwdB1. These fmd/fwd transcript abundance measurements clearly demonstrate that two of the four fmd and fwd gene clusters (i.e., fmdE1F1A1C1D1B1 and fwdD1B1A1C1) are highly transcribed in response to substrate availability, and furthermore this suggests that two distinct formylmethanofuran dehydrogenase activities are concurrently utilized during methanol growth conditions (discussed below). M. acetivorans genome analysis revealed five genes/gene clusters annotated as heterodisulfide reductase, an enzyme essential for electron transfer from methanogenic electron donors to methyl-CoM reductase (Table 1, Figure 2A). These include genes for a membrane-type protein designated here as hdrE1, hdrD1 and hdrD2 similar to those needed for methane formation in M. barkeri. An additional six genes encoding soluble-type heterodisulfide reductase proteins are also present in the genome. They include the hdrA1 gene associated with a poly-ferredoxin-like gene (pfd), an unlinked set of hdrCB genes called hdrC1 and hdrB1, and a third hdr gene cluster designated hdrA2 hdrC2 hdrB2 (Figure 2B). Differential expression of genes in M. acetivorans annotated for hdr (hetero-disulfide reductase). Panel A) Genes encoding the putative membrane-type hetero-disulfide reductase subunits, hdrED1 and hdrD2. Panel B) Genes encoding the putative soluble-type hetero-disulfide reductase subunits, hdrA1 pfd, hdrC1B1, and hdrA2C2B2. The Genebank identification number (MA number) is shown below each gene while the individual gene designation is shown above. Panel C) RT-PCR data for the indicated hdr genes. Quantitative gene expression experiments (Figure 2C) revealed that the membrane-type hdrD1 gene was most highly expressed during acetate cell growth conditions, and where methanol conditions gave slightly lower transcript abundance (ca. 0.7-fold). In contrast, hdrD2 gene expression was very low (i.e., at level of about one twentieth that seen for the hdrD1 gene Figure 2C), suggesting a minor or no direct function in methanogenesis. Interestingly, the abundance of the soluble-type hdrA1pfd and hdrC1B1 gene transcripts were also nearly as high as for the membrane type hdrED1 genes (Figure 2C). Here, acetate growth gave three-fold higher hdrA1 transcript levels versus methanol growth conditions. The participation of a soluble-type hdrABC enzyme in M. acetivorans metabolism is currently unknown but must now be considered. An orf following the hdrA1 gene is annotated as a polyferredoxin (pfd), and this suggests a role for this protein in electron transfer to couple the soluble-type Hdr complex with an appropriate electron donor complex. In contrast, hdrA2 and hdrB2 transcript abundance was about two to twenty-fold lower under the corresponding conditions. This suggests a minor role for the second set of HdrABC-type genes (i.e., hdrA2B2C2) in methanogenesis. The hdrA1pfd and hdrC1B1 genes for the soluble-type enzyme subunits are located at different chromosomal loci, and are coordinately expressed since their mRNA abundance levels are alike (Figure 2C). Additionally, the PCR-based gene experiments also demonstrate that the hdrA1pfd and the hdrED1 genes are each expressed as operons (data not shown). Taken together, these data are consistent with a need for both a membrane-type and a soluble type Hdr enzyme for electron transfer/energy conservation under acetate and methanol cell growth conditions. This suggests that distinct electron transfer pathways are operating to service the alternative Hdr enzymes. The M. acetivorans genome lacks an echABCDEF gene cluster encoding an Ech-type hydrogenase with described roles in hydrogen uptake and ion translocation in M. mazei[3, 5]. Since M. acetivorans cells do not exhibit significant hydrogenase activity [8, 9], some other mechanism must provide a means for electron transfer from cellular donor(s) to Hdr. Interestingly, the M. acetivorans genome contains two sets of genes (designated vhtG1A1C1D1, and vhtG2A2C2) for F420-nonreducing hydrogenase-types (Figure 3A, 3B, Table 1). It also contains a set of frhADGB genes for a coenzyme F420-type hydrogenase (Figure 3A). Quantitative RT-PCR assays (Figure 3C) established that the vhtG1 and vhtC1 genes were each expressed at four- to six-fold higher levels during methanol growth conditions, and this is within the range seen for the fpoL and fpoN genes needed for methyl group oxidation for methanol and acetate metabolism. In contrast, expression of the vhtG2 and vhtC2 genes was low under all conditions examined (Ca. about 17-20-fold lower than vhtG1 and vhtC1). Finally, the frhA and frhB gene expression levels were low relative to vhtG1 or fpoL (Figure 3C), and this suggests a minor role for the frhADGB and vhtG2A2C2 gene clusters in either methanol or acetate-dependent cell growth. Since vhtG1 transcript abundance was elevated and about half of that observed for the fpoL and fpoN genes that encode subunits of the F420 H2 dehydrogenase (Figure 3C), this implies a significant physiological role for the vhtG1A1C1D1 gene products during methanol growth. 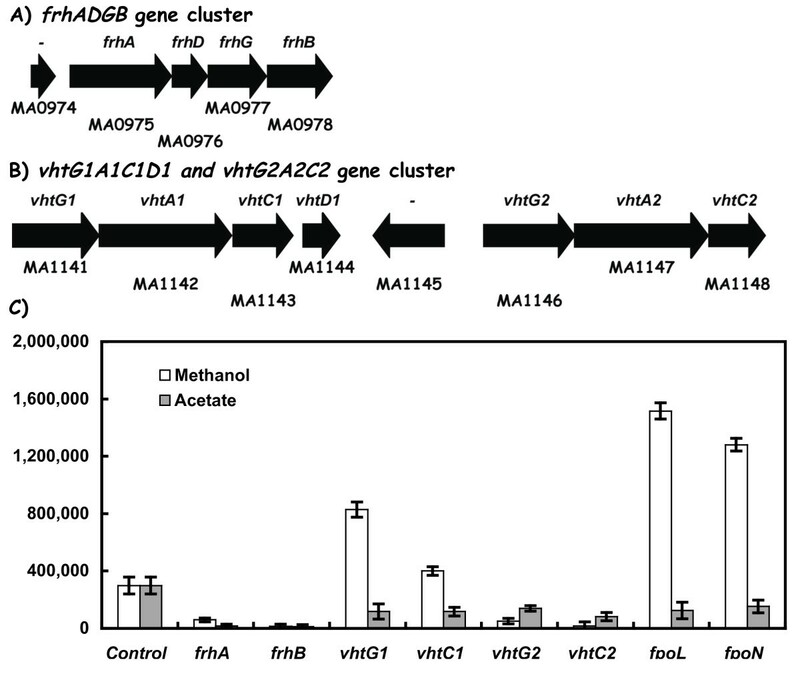 The biochemical and physiological roles for the vhtG1 and vhtC1 hydrogenase-type genes in M. acetivorans are presently unknown. Differential expression of genes annotated for vht (F420 non-reducing hydrogenase) and frhADGB (F420 reducing hydrogenase) in M. acetivorans. Panel A) The genes encoding the frhADGB F420 reducing hydrogenase subunits. Panel B) The genes encoding the vhtG1A1C1D1 and the vhtG2A2C2 F420 non-reducing hydrogenases. The Genebank identification number (MA number) is shown below each gene while the individual gene designation is shown above. Panel C) RT-PCR data for the indicated genes. M. acetivorans contains a set of six genes (MA0659-0664) annotated as nqr123456 that are absent in the M. mazei, and M. barkeri genomes (Table 1). These genes were subsequently re-designated rnfCDGEAB based on sequence comparisons to the rnf and nqr-type genes in other microorganisms, . 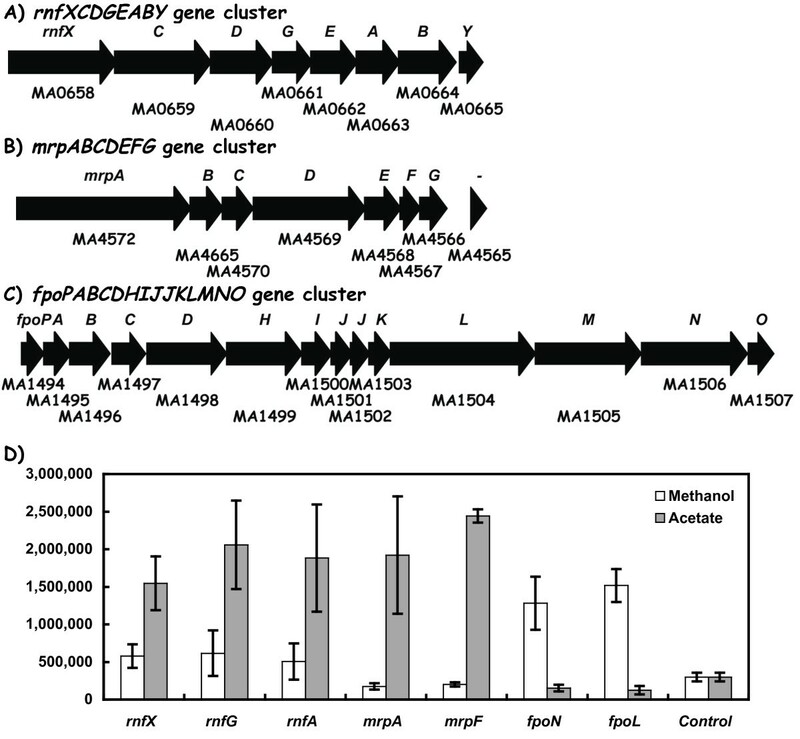 This gene cluster also contains two additional genes of unknown function that we designate here as rnfX and rnfY (Figure 4A) whereby the first (MA0658) precedes rnfC and the second (MA0665) follows rnfB. We propose that these genes may encode unique input/output modules for membrane associated electron transfer since they are absent in other microbial genomes. During acetate cell growth relative to methanol growth conditions, the rnfX, rnfG, and rnfA reporter genes exhibited elevated transcript abundance (ca. 2.5 to 3.5-fold; Figure 4D). Each gene was also more highly expressed than many reference genes involved in central methanogenesis (e.g., fpoN, and fpoL that encode subunits of the F420 H2 dehydrogenase). Therefore, the rnfXCDGEABY gene expression data support the proposal that the products participate in electron transfer during acetate metabolism as proposed via methanophenazine . In addition, they must also function during methanol culture conditions based on transcript abundance (Figure 4D). Other roles can be envisioned including participation in electron transfer to a soluble-type heterodisulfide reductase via a poly-ferredoxin (e.g., encoded by the hdrA1 pfd and hdrC1B1 gene complex, described below). Differential expression of genes related to electron transport in M. acetivorans. The orientation and relative length of each gene is indicated by the open arrows. The Genebank identification number (MA number) is shown below each gene. Panels: A) The eight gene rnf cluster; B) the seven gene mrp cluster; C) the fourteen gene fpo cluster; and D), RT-PCR data for the indicated rnf, mrp, and fpo genes. The M. acetivorans genome contains a set of seven genes called mrpABCDEFG (Figure 4B) with similarity to the gene clusters found in a variety of bacterial species but absent in either M. barkeri or M. mazei (Table 1) [5, 11–13]. The mrp- encoded protein complex in Bacillus subtilis was shown to confer a role in multiple drug resistance and/or pH regulation [13, 14]. As revealed by the M. acetivorans transcript analysis studies (Figure 4D), the mrpA and mrpF reporter genes were expressed more highly during acetate cell growth conditions (Ca. 11 to 12-fold) relative to methanol growth. These levels were above the expression levels observed for the ack, pta, and hdr genes needed for acetate utilization, and within the range seen for the rnf gene cluster. These findings imply a major role for the six mrp gene products in acetate metabolism versus methanol metabolism. M. acetivorans contains genes for a bacterial-type F0F1 synthase encoded by the MA2441 to MA2433 genes designated here as atpDCIHBEFAG, plus an archaeal-type A0A1 ATP synthase encoded by the ahaHIKECFABD genes (MA4152 to MA4160) (Figure 5). Although prior DNA microarray experiments  demonstrated that six of the nine genes in the archaeal-type A0A1 ATP synthase (ahaECFABD) encoding the ATP-hydrolysing/synthesizing domain (A1) were expressed two-fold higher in acetate grown cells relative to methanol, the other genes were not . It is still unknown how their expression varies quantitatively relative to atpDCIHBEFAG gene cluster expression. Corresponding DNA microarray studies with the atpDCIHBEFAG genes that encode a bacterial-like F0F1 complex revealed that only two of the nine genes (atpD and atpC) were expressed significantly higher in acetate by 3.2 and 1.8 fold, respectively: the remaining genes were either not detected or did not exhibit changes. Lastly, relative to central pathway genes for acetate and methanol utilization, it was unresolved how the aha and atp gene sets are expressed since the microarray data did not address this. 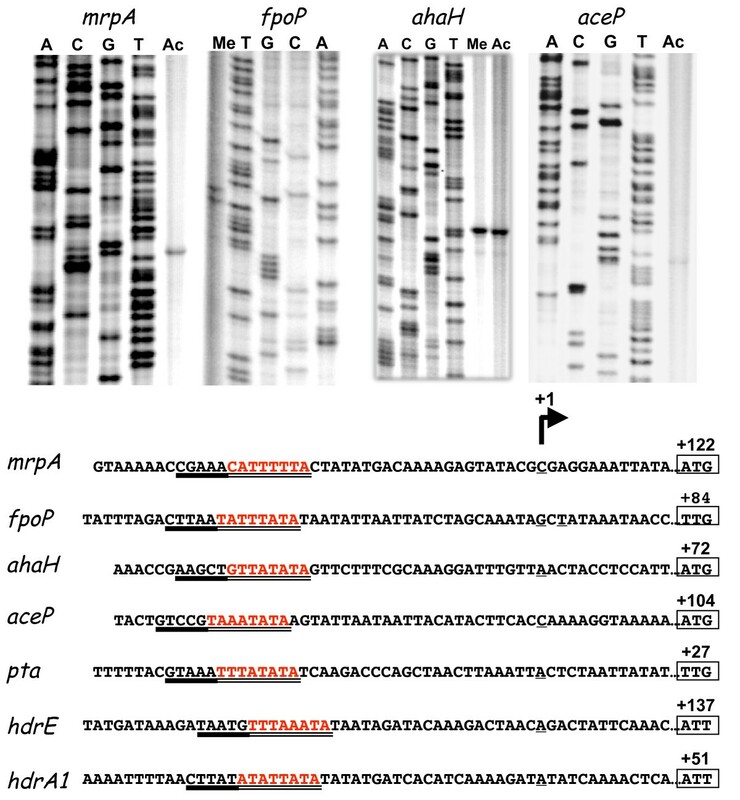 Expression of the atpDCIHBEFAG and the ahaHIKECFABD gene clusters encoding the bacterial-type and the archaea-type ATP synthase complexes of M. acetivorans , respectively. The Genebank identification number (MA number), and individual gene designation are shown above or below each gene. Panel C shows RT-PCR data for the indicated atp and aha gene clusters. From the RT-PCT transcript abundance studies, three representative aha genes representing the archaeal-type A0A1 ATP synthase genes were highly expressed relative to the atp reporter genes (Figure 5C). Acetate cell growth conditions resulted in two-fold higher aha transcript levels relative to methanol cell growth. These genes were the most highly expressed in the cell regardless of the growth condition. In contrast, the bacterial-type F0F1atpD, atpA and atpG genes were expressed at less than 2% of the level seen for the ahaI, ahaC and ahaB genes: this suggests a minor role for the atp genes in methanogenesis in contrast to the aha gene cluster. One M. acetivorans gene of unknown function (MA4008) was revealed by our prior DNA microarray studies to be more highly expressed during acetate growth conditions relative to methanol cell growth (Lars Rohlin, personal communication). Inspection of the amino acid sequence revealed six trans-membrane spanning regions reminiscent of a membrane solute uptake system (Additional file 1, Figure S1 and discussed below). To extend these MA4008 gene expression findings, quantitative PCR experiments were performed (Methods, Figure 6A). MA4008 was expressed at a 125-fold higher level during acetate versus methanol cell growth conditions. Interestingly, when methanol was also present in the culture medium in addition to acetate, MA4008 expression was suppressed to a level seen when only methanol was present (ca. by 215 fold). This indicates that the MA4008 gene is expressed only when the energetically superior carbon substrate is absent, consistent with a proposed role in acetate uptake. The M. acetivorans MA4008 orf is designated aceP for its role in an acetate-dependent membrane function. Two other genes required for acetate utilization are ack (MA3606) and pta (MA3607) that encode acetate kinase and phosphoacetyl transferase, respectively ( Table 1). 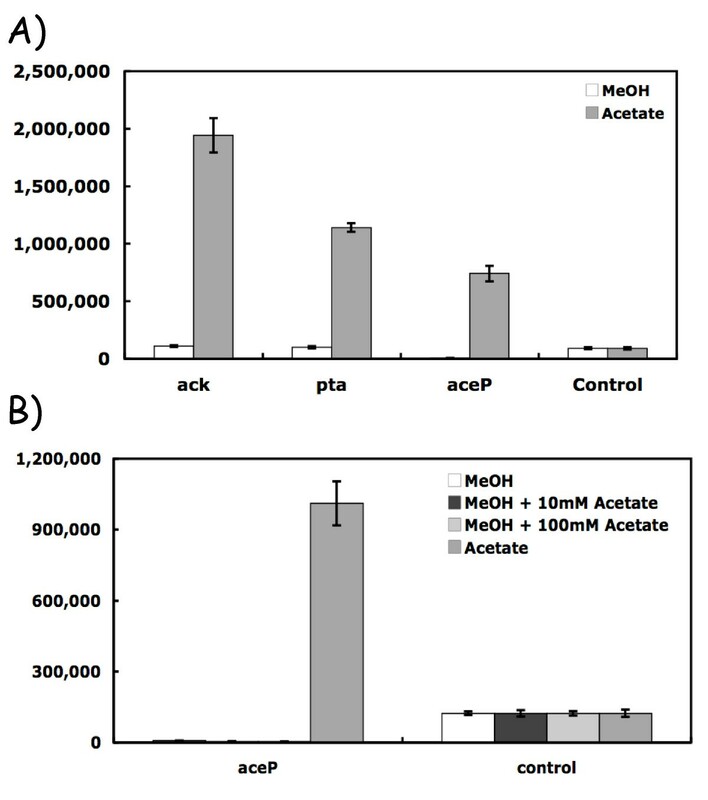 Quantitative PCR experiments (Figure 6A) established that both genes were highly expressed and at levels similar to aceP when acetate was the sole substrate. The 11-18-fold differential pta and ack gene expression findings are similar to previous reports in M. acetivorans and M. thermophila[6, 16]. Differential expression of genes induced in presence of acetate. Panel A) The indicated genes include ack (acetate kinase), pta (phosphoacetyl transferase), and a gene designated aceP encoding a putative acetate uptake system. The RT-PCR data were determined as described in Materials. Panel B) Transcript abundance for aceP from cells grown in the presence or absence of the methanogenic substrate, methanol with the indicated amounts of acetate present. The mRNA 5' ends of the fpoPABCDHIJJKLMNO, hdrED1, hdrA1-pfd, mrpABCDEFG, pta ack, aceP and ahaHIKECFABD genes/clusters were determined to locate their corresponding promoter elements. Using primer extension methods (Figure 7A), all but one of the promoter elements were demonstrated to have long un-translated regions (UTR's) that range from 51 to 137 nucleotides in length. For example, the aceP 5' mRNA end is located 104 nucleotides upstream of the translational start site. Similar findings were seen for the mrpA, fpoP, ahaH, hdrE, and hdrA genes. Only the pta gene had a relatively short UTR (i.e., 27 nt). We did not detect mRNA 5' ends for either rnfX or hdrC1. Alignment of all the upstream regions of these promoter elements (Figure 7A) revealed the highly conserved sequence present in other archaeal promoters, the TATA box (Figure 7B) located approximately 20-30 nt upstream of the +1 mRNA start site (discussed below). This site is bound by the TBP protein that aids RNA polymerase binding . In contrast, the BRE box elements were not well conserved. When the UTR elements and the upstream regions were further examined using a suite of bioinformatics tools (Materials), no clearly discernable DNA sequence elements with either dyad symmetry or direct repeats were found. Similarly, no conserved regions within the RNA UTR's were seen for the coordinately expressed hdrA1pfd and hdrC1B1 genes sets. Location of the mRNA 5'ends for the hdrE1, hdrA1 , mrpA, fpoP, pta, aceP , and ahaA genes. Top panel; Sequence gels for the mrpA, fpoP, ahaA and aceP genes along with the corresponding DNA ladders. RNA prepared from methanol or from acetate-grown cells is indicated by Me and Ac, respectively. Bottom panel: the alignment of the upstream DNA sequences relative to the start of transcription (+1 position). The position of the initiation codon is boxed where the numbering is relative to the start of transcription. The putative TATA-box sequences are double underlined and the BRE-regions are indicated by a solid underline. The mRNA 5' end positions for the pta, hdrA1, and hdrE1 genes were determined with a ubiquitous ladder (data not shown). Prior microarray and proteomic experiments reported transcript/protein ratios for a subset of the M. acetivorans genes addressed in this study [6, 18]. However, by the limitations of the methods used, these studies did not provide expression ratios for many other key methanogenic pathway genes nor did they report information for other genes with potential roles in cell energy generation. Therefore quantitative PCR gene expression studies were undertaken here using M. acetivorans as a model to organism to examine which of the seemingly redundant gene copies in Methanosarcina species are utilized during growth on the alternative methanogenic substrates, acetate and methanol. As a result, we may interpret the resulting data as a readout of cell commitment to make RNA. From these experiments six points are readily apparent. First, this study establishes the simultaneously high levels of gene expression for both a molybdenum-type (fmdE1F1A1C1D1B1) and a tungsten-type (fwdD1B1A1C1) formyl methanofuran dehydrogenase enzyme in M. acetivorans (Figure 1). In contrast, the fmd2 and fwd2 gene clusters were not. The co-expression of the fmd1 and fwd2 gene clusters during routine cell culture suggest that both tungsten and molybdate oxyanions are limiting during cell growth. Alternatively, the cell may somehow require the two gene sets to catalyze different reactions in methanogenic metabolism. Studies of the Methanobacterium wolfei and Methanobacterium thermoautotrophicum enzymes indicate that a tungsten-containing isoenzyme was constitutively expressed and that a molydate-containing isoenzyme was induced by molybdate ions . Studies are in progress to establish if one or both of these oxyanion-metals modulate expression of the M. acetivorans fwd1 and/or fmd1 gene clusters. The M. acetivorans expression findings predict that the homologous fmd1 and the fwd1- type gene clusters in M. barkeri and in M. mazei are used to make the major formyl methanofuran dehydrogenase enzymes (Table 1). Interestingly, the M. barkeri genome lacks the annotated fwd1 tungsten-type enzyme. Second, all sequenced Methanosarcina genomes contain multiple hdr genes encoding a membrane-type as well as a soluble-type heterodisulfide reductase (Table 1, Figure 2). Based on the transcript abundance studies in M. acetivorans, the membrane-type Hdr complex encoded by the hdrED1 genes was the most abundantly expressed gene cluster (Figure 2). This is consistent with the biochemical role for the membrane bound enzyme in M. barkeri. However, given the high transcript levels for the hdrA1 and hdrB1 genes in cells grown with either acetate or methanol, a physiological role is hereby predicted for a soluble-type HdrABC heterodisulfide reductase in M. acetivorans metabolism, and by inference, in M. mazei and M barkeri. The presence of a poly-ferredoxin-like gene immediately downstream of the hdrA1 gene (Figure 2B) provides one candidate for electron transfer from primary electron donors (i.e., from methanol via either formyl methanofuran dehydrogenase, or from acetate via carbon monoxide dehydrogenase) to this Hdr soluble-type enzyme (discussed below). Transcript abundance for both the hdrED1 and hdrA1B1 genes were within the same magnitude observed for the fpoN and fpoL genes (Figure 3C) that encode subunits of the F420 H2 dehydrogenase needed for central carbon flow to carbon dioxide. Since genes for both a membrane-type and a soluble-type Hdr enzyme are co-expressed, this suggests that multiple pathways exist for electron transfer and/or energy conservation in M. acetivorans. By inference, the homologous hdrA pfd and hdrC1B1 gene sets in M. barkeri and M. mazei are also highly expressed and operative. The energetic implication for having distinct Hdr-type enzymes is unknown. Possibilities include adaptation to different substrate levels and/or alternative modes of energy conservation . Third, regarding the M. acetivorans sets of frh, vhtG1, and vhtG2 genes (Figure 3), plus the two electron transfer complexes encoded by rnfXCDGEABY and mrpABCDEFG genes (Figure 4), only the vhtG1, rnf and mrp gene sets were abundantly expressed. The vhtG1A1C1D1 gene cluster encoding a methanophenazine-linked type hydrogenase was expressed at four- to six-fold higher levels during methanol growth conditions, and within the range seen for the fpoL and fpoN genes needed for methyl group oxidation for methanol and acetate metabolism. This is also in the range seen for methanol-dependent fmdA1, and fwdA1 expression (Figure 1). In contrast, no vht gene expression was detected in M. acetivorans when a vht-uidA promoter assay system was used . Whether the high vhtG1 and vhtC1 mRNA levels detected here (Figure 3) versus the low values by the vht-uidA promoter assay is due to strain differences, cell growth, and/or in the analytical methods used is unknown. The vhtG1A1C1 like-hydrogenase genes are conserved among the three Methanosarcina strains (Table 1) where a more complex gene expression pattern is evident across these species [8, 22]. Interestingly, the M. acetivorans vht mRNA expression pattern was similar to that seen in M. mazei, and a physiological role is implied for the M. acetivorans vht genes. The rnf and mrp gene clusters are unique to the metabolism of M. acetivorans since related gene clusters are absent in either of the M. mazei and M. barkeri genomes (Table 1, [5, 23]). As noted by Li, the rnfXCDGEABY gene products are logical candidates to fulfill the role of the Ech-type hydrogenases present in M. mazei and M. barkeri. By this scheme, the Rnf complex would accept electrons derived from the carbon monoxide dehydrogenase (CODH) complex via an associated ferredoxin encoded by the complex. The membrane associated Rnf-type complex is then proposed to transfer electrons on to the membrane associated methanophenazine cofactor (MPH) that in turn is reoxidized by a membrane-type heterodisulfide reductase (e.g. HdrED). From the hdr transcript studies (Figure 2), this enzyme would be encoded by the hdrED1 gene set since hdrD2 expression was low. By an alternative model, one might envision a role for the Rnf complex in transferring electrons to the soluble heterodisulfide reductase complex encoded by the hdrA1 pfd and hdrC1B1 genes via protein-protein interactions. The poly-ferredoxin encoded by pfd (MA2867) from the soluble-type heterodisulfide gene cluster is one candidate to interact with one of the unique Rnf complex proteins such as RnfX or RnfY. Either model is compatible with the essentiality for Rnf based on the effect of an rnf deletion strain that is unable to grow with acetate as a sole carbon supply. Little biochemical data exist to distinguish among these possibilities. Based on the role of the Mrp complex in cytoplasmic pH homeostasis in Bacillus halodurans, a similar function was proposed for the M. acetivorans Mrp-like complex . Both belong to the Group I class of proteins and exhibit similar gene compositions and gene order . Interestingly, several alternative roles have been suggested for the bacterial Mrp genes and include exchange of another type of mono-valent ion, in detoxification, and in interactions with another cellular enzyme to form a membrane complex somehow associated with cellular ion partitioning . A role for the M. acetivorans gene products in cytoplasmic pH homeostasis or the other above roles would make it distinct from other Methanosarcina species since related mrp genes are absent in the other sequenced genomes (Table 1). In this regard, phenotypic analysis of M. acetivorans mrp mutants will be of special interest. The high similarity of the M. acetivorans mrp genes relative to those in the bacteria, suggest an origin in the methanogen by lateral gene transfer event from a Group I organism. Do the M. acetivorans mrp and rnf transcript abundance data provide additional clues about the roles of either Mrp or Rnf? The genes for both are among the most highly expressed in the cell (Figure 4), where the mrp gene expression pattern is similar to levels for the ack and pta genes needed for acetate utilization (Figure 6). The 8-fold higher mrp expression level relative to methanol growth approximates the 8-12 fold seen for the ack and pta genes (Figure 8) in support of a primary role in acetate-dependent metabolism, rather than in detoxification and/or ion homeostasis. In contrast, a second pattern of gene expression is seen for the central pathway genes involved in one carbon oxidations (mer, mtd, mch, fpo, and ftr) that are all more highly expressed by 5 to 11 fold when methanol is the sole substrate (Figure 8). A third set of genes required for both acetate and methanol metabolism are differentially expressed at an intermediate level (e.g., mtr genes, 2.3-fold; hdrDE, 1.2-fold, and hdrABC, 3-fold). The rnf gene expression pattern (i.e., 2.4 fold higher level with acetate) falls in this group. It is interesting to speculate that some of these genes may be controlled in response to electron flow rather than the carbon supply (e.g., acetate versus methanol availability). 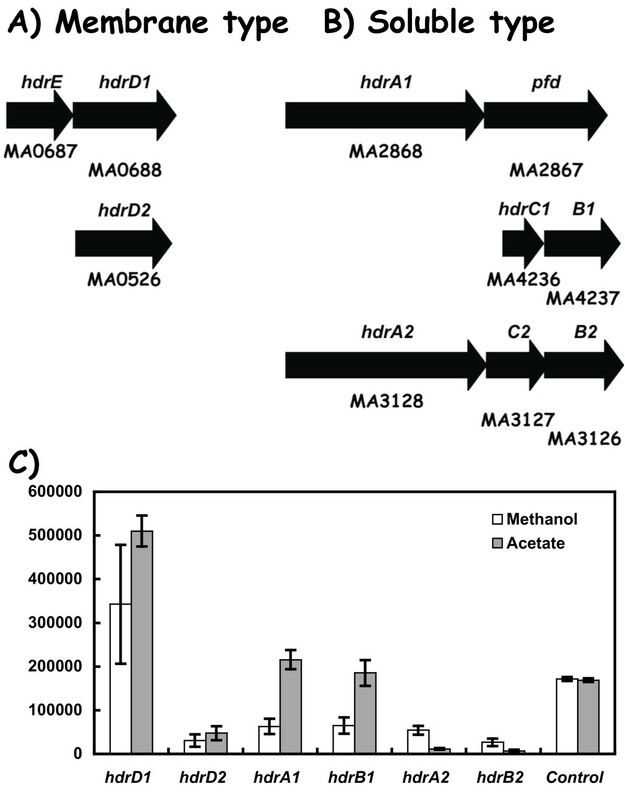 Overview of differential gene expression in M. acetivorans in response to methanol versus acetate utilization. A boxed number indicates the fold-increase in mRNA levels seen for the indicated gene(s) during acetate versus methanol growth conditions. A circled number indicates the fold-increase in mRNA levels during methanol versus acetate growth conditions. All data are from this study except for the mcr, mtr, mer, mtd, mch, and ftr gene ratio data derived from a prior microarray study . The genes/enzymes are: ack, acetate kinase; pta, phosphotransacetylase; cdh, carbon monoxide dehydrogenase; MT1, mtaB2 methyl transferase 1; MT2, mtaA, methyltransferase 2; mcr, methylcoenzyme M reductase; mtr, methyl -H4 MPT:HSCoM methyltransferase; mer, methylene -H4 MPT reductase; hmd, methylene -H4 MPT dehydrogenase; mch, methenyl -H4 MPT cyclohydrolyase; ftr, formyl MFR:H4MPT formyl transferase; fmd, formyl methanofuran dehydrogenase Mo-type; fwd, formyl methanofuran dehydrogenase W-type; fpo, F420 H2 dehydrogenase; hdr, heterodisulfide reductase; rnf, Rnf-type complex; mrp, Mrp-type complex. The control gene was MA3998. Methanophenazine is represented by MPH. The proposed acetate transporter protein is indicated by AceP while the unknown transporter(s) for one carbon compounds is indicated by a question mark. 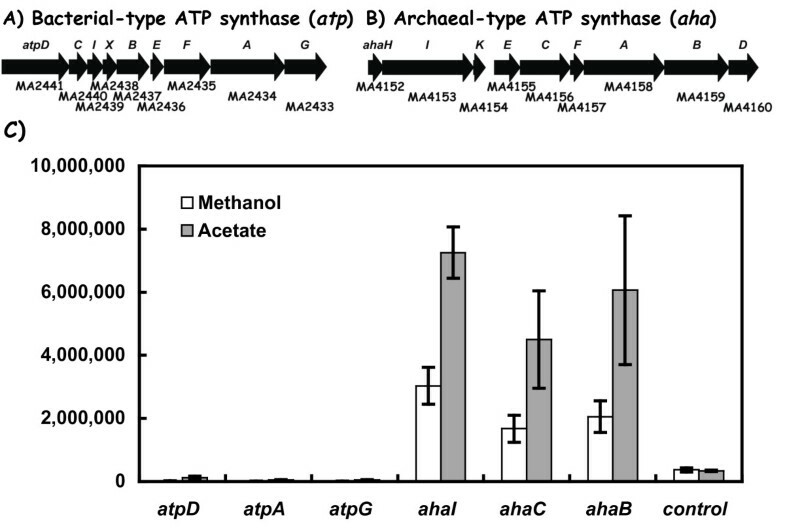 Forth, the quantitative ATPase gene expression studies demonstrate that the archaeal-type A0A1 ATP synthase encoded by the ahaHIKECFABD genes are among the most highly expressed genes in the cell (Figure 5). In contrast, transcript abundance for the bacteria type atpDCIHBEFAG genes was about 175-fold lower than these aha cluster genes during either acetate or methanol growth. Although it is conceivable that the atp-type genes may be significantly expressed under unknown growth conditions, an alternative possibility is that they constitute a "dead-ended" lateral gene transfer event . Interestingly, the deletion of the atp gene region of M. acetivorans conferred no phenotype . The atpX gene present in the M. acetivorans and M. barkeri genomes is conserved in some, but not all bacterial-like ATP synthase operons. It is present in the Rhodoferax ferrireducens DSM 15236, Desulfuromonas acetoxidans DSM 684 and Shewanella frigidimarina NCIMB genomes (gene alignments not shown). Since the synteny of atpX in the above operons is conserved, atpX is not due to an isolated insertion event in the M. acetivorans genome. Biochemical studies have identified essential amino acids involved in translocation of sodium ions by the proteolipid c subunit of the Ilyobacter tartaricus ATPase . To address whether Na+ or H+ ions are transported by the M. acetivorans archaeal-type A0A1 ATP synthase, the ahaK gene encoding proteolipid c subunit was aligned with the corresponding subunits of I. tartaricus plus other well studied microorganisms (Additional file 2, Figure S2). Four amino acid residues at positions 32, 63, 65, and 66 in the I. tartaricus protein to specify Na+ ion movement . These four residues are conserved in M. acetivorans, in contrast to E. coli that is a proton translocating enzyme. This suggests the archaeal-type A0A1 ATP synthase also transfers Na+ ions rather than protons to form ATP, in keeping with the example of Pyrococcus furiosus. Furthermore, the archaeal type ahaK subunit in the three Methanosarcina strains form a distinct protein subclass given the presence of an additional three amino acids relative to position 14 of the I. tartaricus subunit, and a three amino acid deletion corresponding to position 47-49 of I. tartaricus. Amino acid alignments of the A0A1 ATP synthases subunits from the M. mazei and M. barkeri proteolipids suggest the same conclusion for these highly related archaeal complexes (Additional file 2, Figure S2). Interestingly, the alignment of the c proteolipid subunit (atpE) of the M. acetivorans bacterial-type F0F1 synthase also suggests specificity for Na+ ions. A neighbor-joining tree of the archaeal and bacterial c-type polypeptides (Figure 9) reveals a relatively conserved origin of the archaeal-type A0A1 ATP synthase in the Methanosarcina species. Strikingly, the bacterial-type F0F1 synthase genes present in M. acetivorans and M. barkeri are more distantly related to either the archaeal or bacterial type enzymes. This branch of ATP metabolism genes/proteins remains poorly understood and awaits further study. 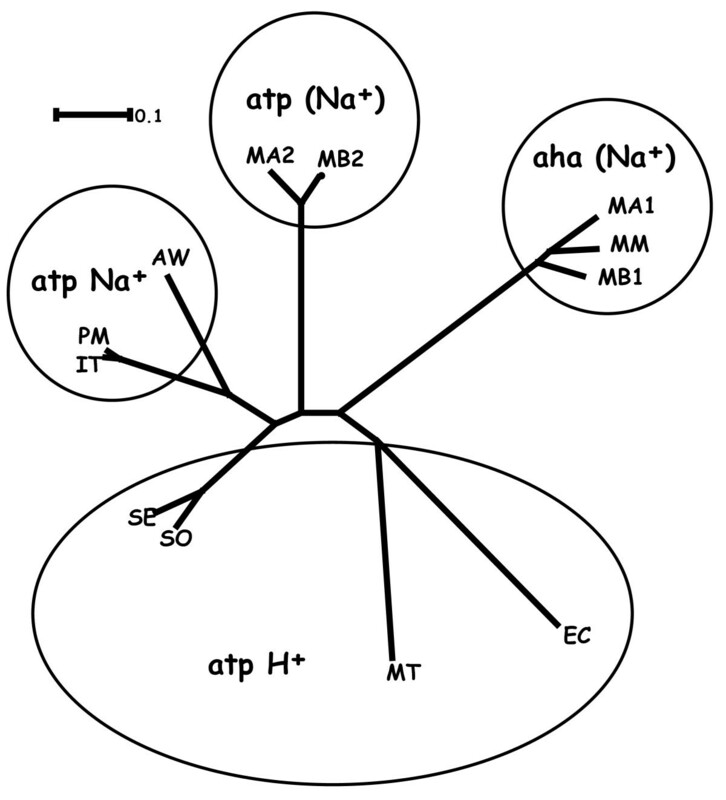 Phylogenic tree of the atp and aha ATP synthase proteolipid subunit c for the methanogens M. acetivorans, M. mazei , and M. barkeri , and for the bacterial homologs indicated in reference . The predicted or experimentally determined ion transferred is indicated from data provided in Additional file 2, Figure S2. Fifth, a candidate gene encoding a potential acetate uptake system for M. acetivorans was identified (Figure 6). This gene exhibits the same expression patterns as the ack and pta genes needed for activation of the methanogenic substrate following its entry into the cell. Expression of aceP was suppressed by the energetically favorable substrate, methanol (Figure 6B). The AceP protein is predicted to have six transmembrane-spanning alpha-helical regions (Additional file 1, Figure S1). Noteworthy, aceP homologs are present in other methanogens including M. mazei, M. barkeri, M. maripaludis, and M. hungatei, and they constitute a distinct class of archaea transporters. Related genes are also present in many bacterial species (Additional file 3, Figure S3), suggesting the possibility of a lateral gene transfer event from a bacterium into the Methanosarcina sp. as was proposed as one explanation for their large genome sizes . Experiments are in progress to characterize the membrane function of the M. acetivorans protein since no archaeal or bacterial homologs shown in Additional file 3, Figure S3 have been examined to date. 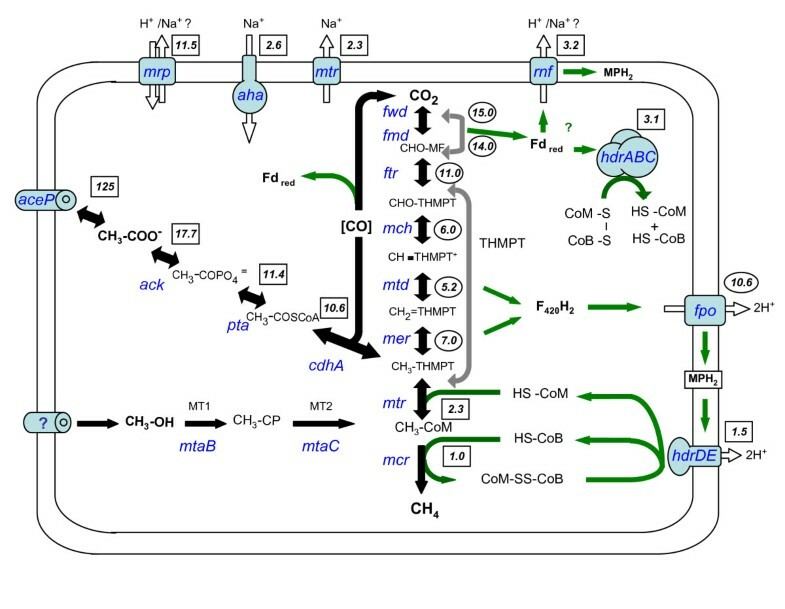 Considerable information is available concerning carbon control of gene expression in bacterial and eukaryal systems, but little is yet known about related carbon control in the Archaea. Few studies have been reported for any archaeal species but include microarray studies in Pyrococcus furiosus, M. mazei[29, 30], and M. acetivorans. The present experiments extend these studies to address a larger set of genes needed for carbon flow and electron transfer leading to methane formation from two key methanogenic substrates (Figure 8). It provides a foundation of RNA transcript abundance and 5' end data to begin exploring regulatory controls in this organism at the level of regulated mRNA synthesis and turnover. Little is known about the relative contributions of archaea transcription factors, translation factors, and/or small RNA's in gene regulation in the Methanosarcina species to provide the distinct patterns of gene expression observed here. M. acetivorans clearly maintains a cellular commitment to dynamically control transcript levels in response to methanogenic substrate type where two major gene families are further defined by this study. Of the twenty M. acetivorans gene clusters examined in this study, all but four were differentially expressed by 2 to 200-fold during acetate versus methanol cell growth (Figures 1, 2, 3, 4, 5, 6). The majority of these queried genes are present all sequenced Methanosarcina genomes that include M. acetivorans, M. mazei and M. barkeri (Table 1) and include the genes for multiple heterodisulfide reductase and hydrogenase-like enzymes. Exceptions are the echABCDEF, vhoGAC, rnfXCDGEABY, and mrpABCDEFG genes that encode known or predicted electron transfer complexes for ion movement and/or electron transfer. A number of the above orfs are assigned new gene designations to aid in their description. The M. acetivorans gene expression data (Figures 1, 2, 3, 4, 5, 6, 7, 8) provides a foundation to understand how energy-yielding pathways are regulated in this model organism and in related methanogens. It is unknown if this control occurs by the actions of classical transcription factors like those found in bacteria and eukaryotes, and/or by RNA control mechanisms involving attenuation, regulated termination and/or small RNAs. Methanosarcina acetivorans C2A  was cultivated in a mineral medium that contained (in grams per liter): NaCl, 11.69 g; MgSO4 7H2O, 12.32 g; KCl, 0.76 g; CaCl2·2H2O, 0.14 g; NH4Cl, 0.5 g; Resazurin solution (10,000 × stock solution), 0.1 ml; trace metal solution (100×) 10 ml ; vitamin solution (100×) 10 ml ; HCl (12.1 N) 0.5 ml; Na2HPO4 7H2O, 1.12 g; cysteine-HCl H2O, 0.25 g; Na2CO3, 3.0 g. An atmosphere (80:20) of nitrogen to carbon dioxide was used in the vessel headspace. Following sterilization, the medium was supplemented with filter-sterilized 0.1 ml 50% methanol or 0.2 ml 5 M acetate per 10 ml medium as previously described . For RNA isolation, cultures of M. acetivorans C2A cells were grown on acetate or methanol with serial transfer of three times to mid-exponential phase before cell harvest. Total RNA was purified from 10 ml of cell samples using the RNAwiz (Ambion Austin, TX) following the manufacturer's instructions. The purified RNA was treated with DNase I as described [31, 32]. The real time reverse transcription (RT-PCR) reactions were performed using Superscript II reverse transcriptase (Invitrogen Carlsbad, CA) according to the manufacturers recommended protocol using random primers and 1 μg of total RNA. A mock reaction without Superscript was run to evaluate for the presence of genomic DNA contamination. To remove complementary RNA, 1 μl RNase H was added to mixture and incubated for 20 min at 37°C. The RNase was then heat inactivated at 70°C for 15 min. The cDNA from the RT reaction was diluted 10 fold, and 1 μl of the diluted cDNA was subsequently used in a 30 μl iQ SYBR green supermix according to the manufactures recommendations following addition of 1.5 μl DMSO. The real time PCR reactions were conducted on a Biorad iCycler (Biorad, Hercules, CA) or an Eppendorf Realtime2 (Eppendorf, Westbury, NY) using a four-step program consisting of, denaturing, annealing, extension, and acquisition steps. The RT-PCR primers were created by a modified version of MyPROBES . The PCR product lengths were in a range of 100-200 bp, the melting temperature was in the range of 55-66°C, the GC content was 55-65%, and the primer length was 17-22 bases (Additional file 4, Table S1). The primers were tested against serial dilution of genomic DNA (106 to 102 copies) to generate a standard curve for each gene tested. The products were also visualized on agarose gels to establish the generation of a unique product of the correct size for each gene probe. Each gene expression value was then determined in triplicate for each of the three biological samples in conjunction with a genomic DNA serial dilution standard. Melting curves were analyzed to establish that non-specific amplification had not occurred (i.e., biphasic vs mono-phasic for a single product). The reported copy number was calculated from a total of nine data points. Each gene was also tested against the mock reaction. The gene expression data for each gene was compared to a reference gene (MA3998) that showed no significant up or down regulation in microarray experiments of Li, et al. . In an independent approach, all qPCR signals were also normalized to the total amount of RNA used in the experiment, and in a separate analysis, to the RNA for the mcr genes (MA4546-4550) that encode methyl coenzyme M reductase. The results from the latter two approaches were in excellent agreement to the MA3998 normalization procedure. Values are reported in transcript copy number per 5 μg total RNA. To determine mRNA 5' ends, primer extension reactions were performed as described previously  using gene specific primers which were located approximately 60 bases downstream of the ATG start codons of the mrpA, hdrE, hdrA, aceP, ahaH, pta, and fpoP genes (see Additional file 4, Table S1 listing each primer). Total RNA was isolated described above. A total of 30 μg of RNA was used in each primer extension reaction: the primer and RNA was heated to 85°C for 10 min, and then slowly cooled to 45°C: 33P-labeled dATP and unlabeled dCTP, dGTP, and dTTP were added to the mixture, and reverse transcription was then performed at 50°C using Superscript III Reverse Transcriptase (Invitrogen Carlsbad, CA) according to manufactures recommendations. The reaction was stopped by sequentially adding 5 μl 3 M sodium acetate (pH 5.2) and 150 μl 100% ice-cold ethanol followed by overnight incubation at -20°C. The cDNA's was precipitated at 13,000 rpm at 4°C for 35 min. For generation of fragments of the indicated regulatory region was cloned into TOPO-PCR4 vector (Invitrogen Carlsbad, CA). The Sequtherm Excel II Kit (Epicentre Madison, WI) was used to perform sequencing reactions of the DNA regions cloned into TOPO-PCR4 using the above primers to confirm the intended sequences. The extension and sequencing products were resolved on a 6.0% sequencing gel and exposed to a phosphorimager screen as previously described . Protein similarities were determined using BLAST , the alignment and the phylogentic tree of proteins were done with clustalw  and the visualization of the trees were done with splitTree4 . Upstream DNA regions were searched for palindromic and repeated motifs using simple Perl script software written in house. Similar searches were also performed for conserved elements in the UTR regions. This research was supported by the National Science Foundation grant award NSF-0110762, Department of Energy Biosciences Division grant award DE-FG03-86ER13498, and the UCLA-DOE Institute of Genomics and Proteomics. LR performed the gene expression and informatics analysis of the genomes, and contributed to the concepts and strategy for performing the study. RG provided critical comments to improve the experimental design, and manuscript layout. All authors were involved in analyzing all the data, read and approved the final manuscript.